Over/Under: Over 163.0 at 1.90 Bet Now! The reasons are very different but both sides will be desperate for a win in this Friday night Euroleague game. Anadolu hold a 13-11 record and at this point, they are the team in the final Playoff place. It is better to be in the final Playoff place than the position below it but there is no denying that Anadolu will be looking to improve their standing. Brose Bamberg, with an 8-16 record, come into this game knowing that a loss sees them knocked out of the running for the Playoffs. This will be the sixth meeting of these sides and it is the Germans that hold the upper hand with a 2-3 record at this point in time. Bamberg grabbed a win the last time these two sides clashed, the game finishing 91-83 with Fabien Causeur grabbing 28 points in that game. This was a career high for Causeur so he will go into this game brimming with confidence knowing that he can do the damage against the Turkish side. The hosts will once again turn to Thomas Huertel for leadership and Heurtel has offered an average of 13.8 points per game. There has also been support from Derrick Brown, with an average of 13.3 points per game while Bryant Dunston has offered an average of 10.5 points per game. If these players find the form the league knows they can produce, it could be an enjoyable night for the Turkish team. The fact that Baskonia Vitoria Gasteiz grabbed a win on Thursday night was bad news for the Germans. This makes the game a final chance one and if it is a home win, Brose Bamberg know that they are out of the running for the Playoffs. Darius Miller has been key for Bamberg this season, offering an average of 12.7 points per game while Nicolo Melli has chipped in with an average of 12 points per game. 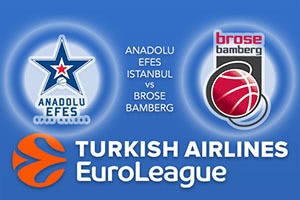 The hosts should have enough about them in this game so back Anadolu Efes Istanbul at -8.5 at odds of 1.90. If you’re looking for the Over/Under market, go OVER 163.0 which is provided at odds of 1.90. Bet Now!